We understand that choosing the right horse stall can sometimes be confusing. Our horse stall doors come in just two styles – sliding and hinged doors. Sometimes the selection between choosing sliding or hinged horse stall doors, may be a point of preference or necessity. For example, if your barn aisle way is narrow sliding horse stall doors may be the best fit for you and your horse. Regardless, we have the expert staff available to help you navigate between the various features and options you may want to incorporate into the design of your horse stalls. Many hinged horse stall doors are incorporated into graceful European Horse stalls but hinged doors can also be incorporated into a more traditional box horse stall design. At Classic Equine Equipment we take great pride in proudly producing the highest quality Horse Stalls regardless of budget. Whether you are remodeling a barn or building new, Classic Equine has an expansive selection of high quality horse stalls to choose from. We also have the knowledgeable staff to assist you with your project. The best outcomes happen when we can begin working with our customers early on in the process. This allows us to get to know you and understand your needs and project requirements. While many companies only offer "buy it and like it" horse stalls, we manufacture our horse stalls to meet your needs so you can spend less time working and more time riding. With more of a traditional look, our sliding horse stall door gallery will show much of what we can do. 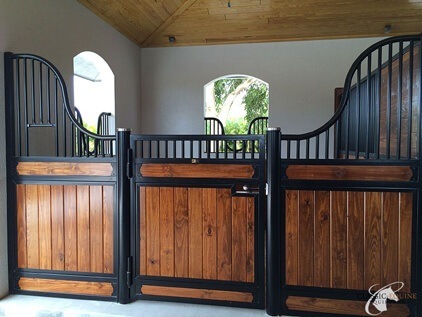 We have the ability to tailor our standard horse stall designs to suit your individual preference and style. 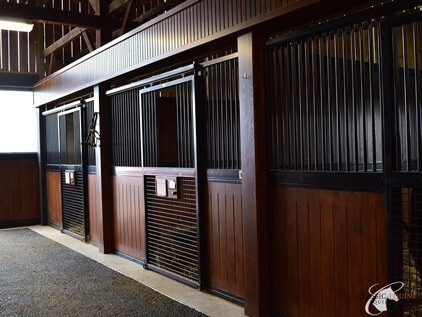 Our hinged horse stalls feature a unique style and design element. Using elegant curves and design features, we tailor these fronts to fit your needs, giving your barn the ultimate in function and appearance.